Welcome to Team Mission! 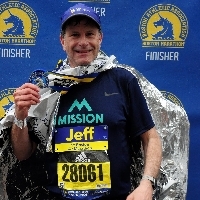 On April 15th, members of Team Mission will be running in the 123rd Boston Marathon and supporting the Mission Adventure Project. The Adventure Project exists to give survivors ages 12 to 30 across the U.S. fully-paid access to the fitness and wellness resources they need to get to the other side of cancer and stay there. Each survivor is on a journey — one that demands ongoing attention to training ability, overall health, injury prevention and motivation. Expensive equipment, memberships, coaching or training shouldn’t be the biggest hurdle young survivors face in their endeavors. Through Adventure Project Grants, Mission is committed to helping young survivors overcome financial impediments to living long and well after cancer.